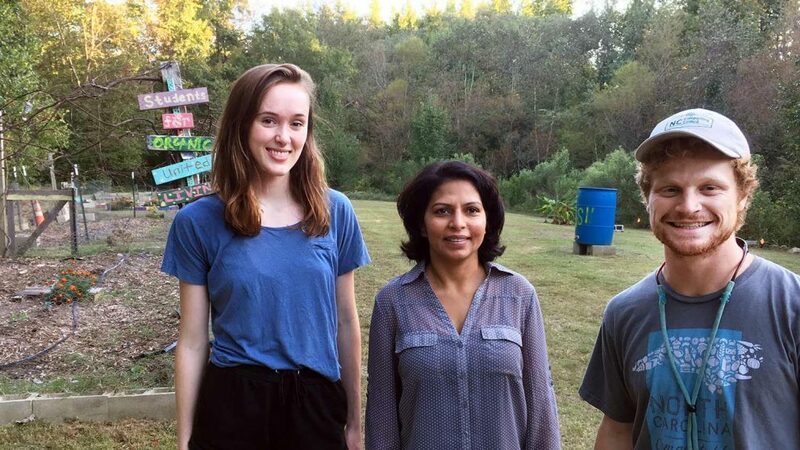 SOUL Garden student leader Rachel Witner (left), adviser Shamsa Visone and student Garnett Bullock (right) at the garden. Through SOUL Garden, students learn about sustainable gardening and leadership. 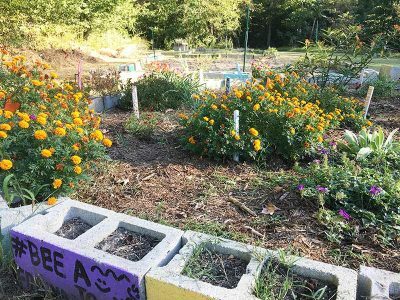 Near the banks of Lake Raleigh is an NC State garden that grows food while also developing student leaders. Students for Organic, United Living ‒ or SOUL Garden as it’s better known ‒ is NC State’s only student-led community garden on Centennial Campus. A portion of the SOUL Garden is devoted to pollinator-friendly plants. Last year SOUL Garden grew enough produce to feed more than 40 people, but that’s just the start of the garden’s harvest. Increasingly, the garden is home to student innovations, such as a greenhouse that Harrell and other students are building from a salvaged soccer goal post. Other students have designed and planted pollinator gardens, installed raised planting beds, built a gathering space, planted fruit trees and started a compost collection program called Scrap to Life. Every week Scrap to Life volunteers pick up compostable material collected by businesses located on Centennial Campus. The material goes to SOUL Garden, where students manage the process of transforming it into nutrient-rich compost for the garden. 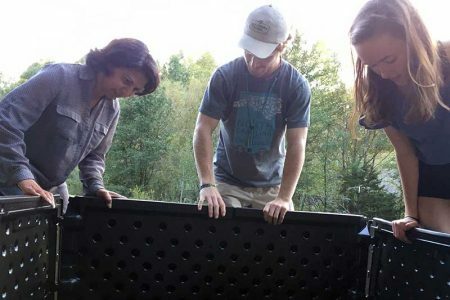 “A goal of mine is to divert the amount of material sent to landfills, and composting not only does this, but it replenishes the soil with nutrients needed for plants to thrive,” says student Rachel Witner, who leads Scrap to Life. Witner has been involved in SOUL Garden since her first year at NC State when she joined to reconnect with nature through gardening. The garden’s adviser, Shamsa Visone, wants the garden to cultivate students into the leaders of tomorrow. An NC State employee and alumna, Visone mentors 16 student interns who work in various teams to advance the garden’s mission. SOUL Garden adviser Shamsa Visone (left) student Garnett Bullock and student Rachel Witner (right) assemble a storage container at SOUL Garden. “Every day, we look for new ways of bringing confidence to our students so they can graduate feeling empowered to take on the world,” Visone says. Recently, one of the hard lessons students have learned is how to rebound after setbacks. During Hurricane Matthew in October 2016, the garden flooded, destroying most of the crops and other infrastructure. Since then, the students have rebuilt the garden in more resilient ways, including the installation of raised beds and fencing to protect crops. This spring, the garden will receive an efficiency boost when members of the NC State chapter of Engineers Without Borders install a drip irrigation system that will irrigate the garden using water from Lake Raleigh. Today’s momentum is just one reason to celebrate. In 2017, the garden received an NC State Deborah S. Moore Service Award for Outstanding Student Organization. In 2018, the garden reaches its milestone eighth year as an outdoor classroom where dozens of students have learned about food, gardening, leadership and how to Think and Do. Published in Food, News, Students, Uncategorized.